Native American Kateri Tekakwitha and six others have been named as saints by Pope Benedict XVI at the start of a new drive to deepen the faith of believers. The pontiff named the seven at a ceremony in St Peter’s Square at the start of a “Year of Faith”. 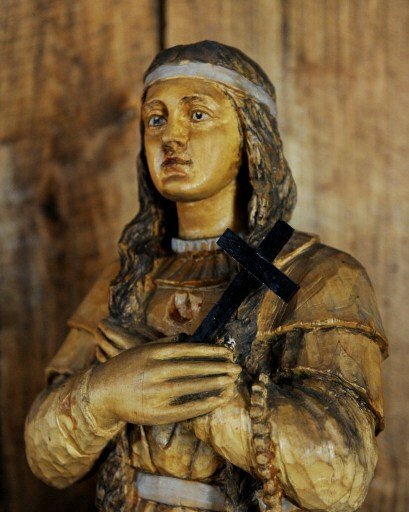 Kateri Tekakwitha, who lived in the 17th Century, impressed missionaries with her deep spirituality. The other new saints include a nun who tended a Hawaiian leper colony and a French missionary killed in Madagascar. In the Roman Catholic Church, a saint is a person who has been recognized officially as being in Heaven. As the sun rose over St Peter’s Square on Sunday morning, Native American pilgrims in beaded and feathered headdresses sang songs to Kateri Tekakwitha, the Associated Press news agency reports. In recent a years a miraculous intervention has been ascribed to Kateri Tekakwitha, who was born in what is now New York State and died in what is now Canada. The Vatican believes she saved the life of a Native American child who was being ravaged by a flesh-eating bacterium. This, the Church decided, was the final miracle required to qualify her for sainthood. It is also felt that her elevation would give Native American Catholics an important boost. They are criticized by some in their communities for retaining the Christian faith, regarded by some as an imposition by European colonizers. Kateri Tekakwitha, who is sometimes known today as Lily Of The Mohawks, died at the age of 24.